One need not be a libertarian to recognize the truth in the following column. Forcing any organization, company or individual to purchase or do anything in violation of their conscience is wrong, not only for religious organizations, and should be recognized as such by the righteous movement building against Obama and his mandates. We also heartily agree that the American bishops have precipitated this crisis by "their full-throated endorsement of the modern welfare state." The American bishops have the right and responsibility to speak out on the broad moral issues of the day. They exceed their responsibility and competence when they address the details of public policy. That is the arena for competent lay faithful. It was the American bishops who were in full-throat support for Obamacare. Did it not occur to them that shackles might follow the shekels? The bishops' responsibility is to teach, govern and sanctify within their dioceses. The past decade revealed how miserably a majority of them have carried out their primary duties. They should get their own houses in order and dispense with lobbyists. This past Sunday, bishops around the United States delivered to their congregations a short pastoral letter urging prayer, fasting, and legislative lobbying against the Obama administration’s announcement that all employers, most religious institutions included, will soon have to subsidize their employees’ contraceptives, sterilizations, and abortion-inducing drugs. Given the terribly low expectations most Catholics have of their bishops, it is no surprise that many of my co-religionists, surveying the now-daily condemnations by clerics and laymen (on both the orthodox "right" and the dissenting "left") speak of a proverbial "waking" of "the sleeping giant." But I’m afraid a dose of ecclesiastical realism is in order. All indications are that the bishops’ approach to these events is woefully off the mark and cannot but backfire against them in the long run. In short: the bishops themselves bear a significant share of the blame for these latest actions by the administration, and in some respects the Catholic faithful are receiving their just deserts. Let me be clear: the bishops are absolutely on-target when they insist that the new regulations are both constitutionally dubious and morally atrocious, and that because these executive rules are unjust laws (an oxymoron if there ever was one) civil disobedience is the only legitimately Christian response to them. But where they fail most miserably is in realizing why these regulations are wrong. To this writer’s knowledge, not a single bishop has spoken out against the inherent immorality of the federal government forcing any employer to provide any particular benefit to prospective employees. Furthermore, in seeking exemptions solely for religious institutions the Church is neglecting to defend the conscience rights of for-profit employers whose Christian or other moral convictions would otherwise preclude them from complying with these regulations with a clean conscience. In the interests of space, I cannot possibly give a detailed exposition of why it is that the only political philosophy that is compatible with the Gospel and the immutable core of Catholic social teaching is in fact some species of libertarianism. That’s libertarianism, not libertinism. At its core, libertarianism is nothing more than the political realization of the non-aggression principle, i.e., that the only time force is ever a proportional reaction to another’s evil is when that other has himself first resorted to violence and so must be punished and defended against. This means that the state can never morally resort to force (and yes, all government rules and regulations are exercises in force) in order to impose Caesar’s subjective determination of the precise contours of so-called positive rights; rather, the state must limit itself to employing force only to defend the innocent from violent aggression against their negative property rights ("property" defined as one’s life, liberty, and possessions). 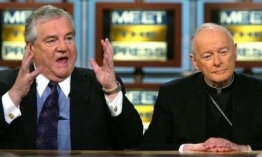 Most Catholics, including most "conservatives," confuse libertarianism with libertinism. They mistakenly believe that libertarians are social atomists who deny the real existence of objective moral obligations to the weak and the indigent. I do not personally know a single libertarian that believes such; doubtless there are some who do, but not because they are libertarians. A libertarian may or may not be a social atomist; but suffice it to say no Catholic libertarian can be one. Thoughtful Christian libertarians do not deny that charity is positively mandated by both the natural law and the Gospel. We do not deny that justice demands that we give of our time, talent, and treasure to serve the needs of those materially and spiritually worse off than we are. We do deny that there follows from these premises a moral right on the part of any man, democratically elected or not, whether he call himself Caesar or citizen, to impose at gunpoint his subjective determination of just how much superabundant time, talent, and treasure one man owes another. The Church has not yet embraced a properly Christian libertarianism and made it her own, but several Catholic intellectuals and activists have (from Tom Woods and Jeffrey Tucker to Dorothy Day and Peter Maurin), and they are no less Catholic for it. Unfortunately, neither the US Bishops nor the Holy See have caught up to the lessons of history, and neither has taken to its logical conclusion the fundamental premises of their own Church’s social teaching. It took the Church several centuries to definitively disavow her acquiescence (since the late Middle Ages) to the notion that the state had a moral right and obligation to violently enforce a man’s positive religious obligation to embrace the true religion and worship God according to the approved rites of His Church. For centuries, the Church, as ferociously as the most pious Islamist, endorsed the putting-to-death of apostate Catholics and, where feasible, the political subjugation of all non-Catholics besides, this in the hopes of encouraging the latter to embrace her true faith. This is an awfully truncated summary of a very complex history that must be understood with an appreciation of unique historical circumstances, and without anachronistically imposing present moral standards on our cultural forbearers; and it is worth noting to my readership the little-known fact that Protestants down through the 18th century and beyond almost unanimously endorsed these same policies. Nevertheless, this is a substantially accurate summary of a tragic history, and one that no amount of ahistorical pop-apologetic will do to mollify. I bring this up not to re-open old wounds, but to make a point: The Church learned, through centuries of political trial-and-error, that it does not follow from the objective immorality of irreligion that the state has a moral right or duty to exercise coercive force to impose Catholic orthodoxy on an unwilling person. Besides being wrong in itself, religious persecution of non-violent "heretics" and "infidels" has had disastrous real-world consequences for the freedom of the faithful and the spread of the Gospel. For example, it is no accident that the same nations which once produced the Sun King, the Spanish Inquisition, and the conquistadors gave the modern era the Jacobin Reign of Terror, the Spanish Red Terror, and the Mexican Cristero War respectively. From Nazi death camps to Communist gulags, a common moral confronts the Church of the 20th and 21st centuries: whatever Caesar can do for the Church, he can and will do to her, and with a vengeance! Sadly, the United States bishops have failed to apply this lesson to their full-throated endorsement of the modern welfare state under the Orwellian rubric of "social justice". Rather than devoting their time and resources to transforming Catholic parishes into real power-houses of real social justice for their local communities, the bishops have adopted a model of social polity that can, without much exaggeration, be reduced to the formula: God + Socialism = Catholic Social Teaching. Activism, that would be better and more evangelically spent pooling the resources of every practicing Catholic in every parish to provide near-comprehensive social services that would make Catholics (and others, but let’s begin at home) less dependent on Caesar and an immorally ungrateful entitlement mentality, is expended every year, to the tune of millions of dollars, lobbying state and federal legislatures to expand Caesar’s power and overreach. What right do we Catholics have to be shocked and indignant at the latest show of religious persecution from the Obama administration and the Democrat Party? For decades our bishops have insisted, well beyond their competencies as successors to the Apostles, that the state must provide "basic health care" to its citizens, and they have raised no objection to that same state requiring private employers to provide such for their employees. Are we really surprised that Caesar, having been handed the Catholic imprimatur for these powers on a silver paten, has now decided that abortions, contraceptives, and sterilizations constitute "basic health care"? Every sensible libertarian, and many a mainstream "conservative," saw this coming: why didn’t any of the bishops? Just about everything I’ve written above can be said of many an Evangelical leader, and to varying degrees, but I hope my Catholic brothers and sisters will forgive my taking the time to take the log out of our own eye before examining the specks in others. Prayer, fasting, and repentance are certainly called for as we resist the latest moves of the Obama administration, but I would humbly suggest the bishops take a sincere look at how their own disastrous political prescriptions have contributed to the present crisis. Thankfully, Lent is just around the corner, and this year’s penitential season is as good a time for serious political metanoia as any. Eric Giunta [send him mail] is a recent graduate of Florida State University College of Law, where he served as president of that school’s chapter of the nation’s premier fellowship of conservative and libertarian law students. It put into words what I've felt for a long time but could not articulate. Right on the mark. It's very hard to have much sympathy for the bishops' present predicament. When Obamacare passed, their only concern was to carve out an exemption for themselves on abortion so they wheeled and dealed with the Democrat devils and cheerfully sold middle-class America down the river. I don't feel like lifting a finger to help them, but I guess I'll have to. It really, really irks me. I spent months fighting Obamacare and wrote emails and made phone calls to my bishop begging him to condemn the whole thing, and warned him that there was a family planning mandate in the works. Why could a little housewife like myself know what was coming down the pike and the bishops with all their expertise and all their resources did not? They really believed, obviously, that they could hammer out a deal with Nancy Pelosi and slip under the wire.